Because of the advent of C, the CE is open to a lot more possibilities. I went ahead and grabbed a nice looking checkers engine and coded the interface and GUI around it, including user movement and such. Now you can play checkers against a pretty difficult AI Or even make the calculator play against itself, which is enjoyable to watch I guess. Anywho, here's some screenshots and hopefully the download will be up shortly. It also auto-saves all the positioning and board information, so reloading your games is a breeze. Hopefully the source is inspirational to someone All told, this took about a day to make, so in all seriousness, I <3 C.
Looks great! If the AI is playing against itself, is there a way to break out of it? I remember having a chess program on my TI-86, and the AI got into a stalemate when playing against itself, so I had to reset the calc. Yeah; there is. I'll probably move to interrupt driven input to make certain, but right now it should work just fine. Thanks all! The link has been updated with the download things. Looks like the circle routine could use some accuracy improvements. Optimized some routines and make best move calculation a lot faster for even quicker playing Hopefully should be updated soon. How does it auto save? Please don't post on the same thread within 24 hours of your last post unless somebody else posted. This is called double posting and is frowned upon here. Edit your post instead. Well, for reals. There's already hundreds of thousands of programs out there written in C, and many more in similar language variants such as Java and others. It's pretty easy to take any general algorithm and compile it, and it outperforms even assembly sometime with the fancy things it can do. (Although size is generally a bit bigger for sure). Regardless, it would be nice to see some C programs out there, but I sense that people want to stick with the languages that they are most familiar with, such as hybrid basic and such. That's fine I guess; we are all in different stages of learning C is literally a lot easier to understand and write than BASIC even, in my opinion. Like, you aren't limited to the amount of BASIC variables on calc, you can directly access hardware ports, read/write memory directly, and so, so much more. It's just the best. Do exactly the same thing. It's just a mater of learning, which is really simple with practice. If you can jump the opponent somewhere, then it makes you do the jump. Could you make it so it doesn't do that, or an option that turns that off? 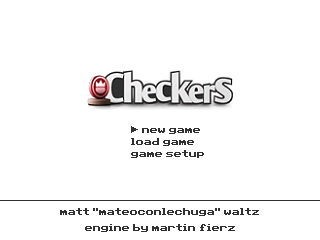 Other than that, I think CheckersCE is great! Its awesome that we can program in C now! Anywho, I also updated the source to use the new and improved graphics library, along with compression of the logo sprite, which saved around 3kb. There are 238 users online: 9 members and 229 guests. © Copyright 2000-2019 Cemetech & Christopher Mitchell :: Page Execution Time: 0.212162 seconds.